Created for Ludum Dare 43 "Sacrifices Must Be Made"
Lay 3 other cards facedown between the players. These are the "3 Piles". Each turn you and opponent say "Ready". When you are both ready, you play a card from your hand to one of 3 Piles. You must play at the pile you selected before saying "Ready". Do not change your choice in reaction to your opponent. After playing cards and resolving the results, You win if your card color is on top of every Pile or in a stack of 3 on 1 Pile. If you play on the same Pile, the higher card stays, lower card is discarded. Tie: both are discarded. Aces are high. Instead of playing to one of the 3 Piles, you can instead play into "The Pit". The Pit is the table space to the side of the Piles. If your opponent plays into a Pile and you play a lower card into The Pit, both cards are discarded. 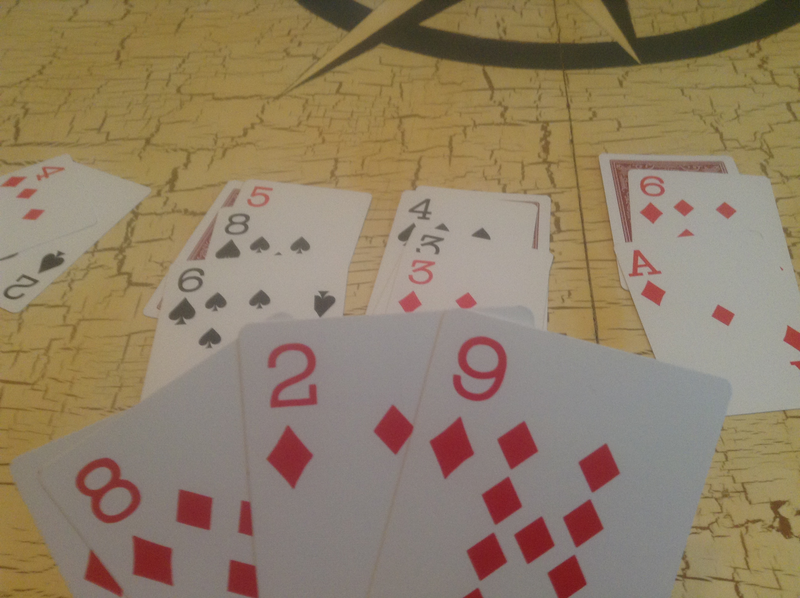 If you both play into the Pit, the higher number card is returned to that player's hand and the lower is discarded. A tie in the Pit: both cards are discarded. Player with the most cards in all 3 Piles. Additional Tiebreaker: Sum of your cards in the 3 Piles.